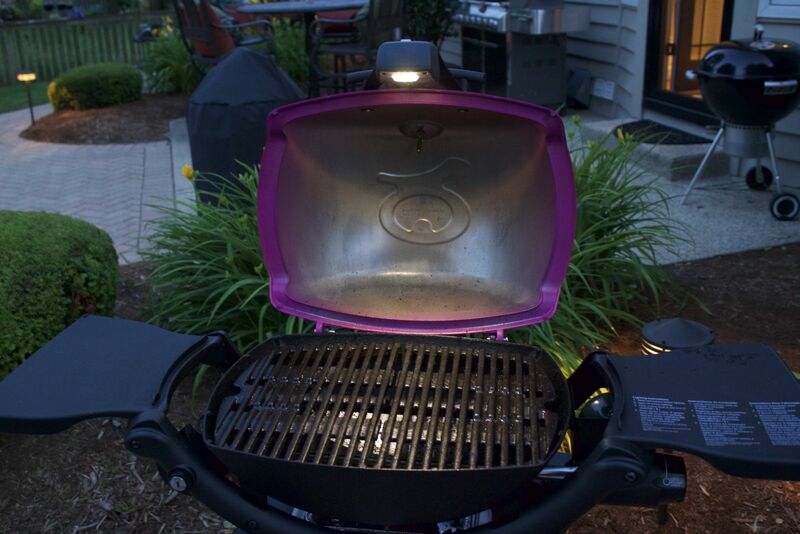 Let There Be (A Grill) Light! So now that I have the Q in color grill, I had to see my food in color too. My newest accessory is the Grill Out Handle Light. Not only am I able to see my food better, I can actually take a good picture of it when I’m done –because that’s the important part, right? Nighttime is one of my favorite times to grill. The weather has cooled down and my day is easing into an end. You can imagine the struggle that a dark cooking surface brought to that perfect evening. I am no longer deprived of seeing the great flavor that comes from my burgers, regardless of the hour of the day. My favorite part about my new accessory: it has a tilt sensor that turns the light on when I open the lid, and off when I close the lid! So yes, now I don’t have to worry about my body casting a shadow over my food, it’s a miracle.